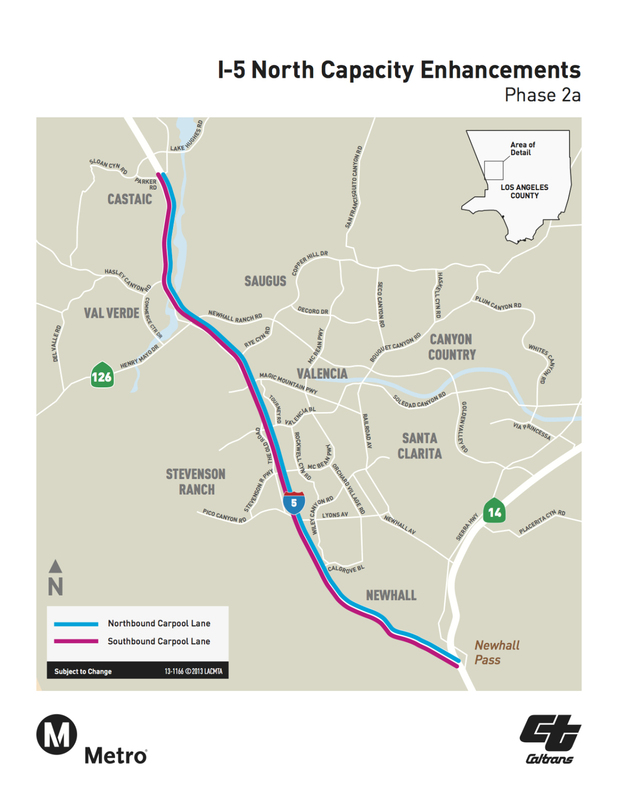 We posted last year about a Measure R project to add tolled HOV lanes to 13.5 miles of the 5 freeway in the Santa Clarita Valley between the 14 freeway and Parker Road. Vehicles with one or two occupants would pay a toll while vehicles with three or more occupants could use the lanes for free; tolling the lanes allows the project to be built well before the original Measure R completion date of 2040. Today we have this update: Metro and Caltrans have decided to publicly finance the project instead of seeking a public-private partnership (known as a PPP). Why? It’s less expensive to publicly finance the project by using $352 million in now-available Measure R and other funds and a federal low-interest loan for $175 million. Under a PPP, a private firm or firms would have paid for the construction of the project and then been repaid, in part, by collecting and managing tolls from the lanes for 35 years. In this case, public financing will allow Metro to borrow less money and secure a lower interest rate on the needed loan. This project as originally proposed was also unusual because it included new sound walls for the 210 freeway in Pasadena and Arcadia and the 170 and 405 freeways in Los Angeles, and adding extra lanes for a short stretch of the 71 freeway in Pomona. Under the public financing deal, those projects will be built separately. The toll revenues would be reinvested and used for transit services and traffic operations in the 5 freeway corridor in the Santa Clarita Valley. The current forecast calls for the HOV lanes on the 5 to open in 2021, the soundwalls to be completed in 2019 and for the additional lane on the southbound side of the SR-71 to be done in 2021 and the lane on the northbound 71 to be finished in 2028. This is good news. When does the modification of the lands start? Another toll road, being financed with TAX funds from Measure R. That was not the deal. Bait and switch. Yay! More road-widening. Just what the region (and its air quality) need! P.S. SR71 is, for almost all of its route through Los Angeles County (Metro’s jurisdiction), an expressway not a freeway. Is Metro proposing to build yet another freeway? Gee thanks! And this gets people OUT of their cars, and ON TO TRANSIT. how again? This is such a great use of limited public taxpayer funds. We should try to widen every freeway in the County so that more cars are able to experience the gridlock that results from this endless pouring of asphalt. Way to encourage the use of public transit, Metro! At least this project is being used to add in a toll lane, which is actually an investment to bring in more direct revenues from car drivers. It’s going to cost $352 million now, but the revenues earned from the toll lanes will be forever. That’s a better investment than just spending money on something which brings in nothing like stupid artwork projects or building the rail system only to run it on the honor system which lead us the fare evasion mess and fare hikes. This is the part that Metro is actually doing things right – investing money to make money down the road. This isn’t like the 405 freeway widening project, it’s adding a toll lane, tolls which generates revenue. And that’s the way it should be. If Metro had at least half the brain to do the same thing when they were building our rail lines like operating a gated system from the start, operating under a distance based fare structure, and incorporating ideas from abroad like dedicating some retail space to stations available for rent, it too would’ve been making money to help run transit. Metro should stop expecting tax payers to bail them out all the time with more taxes or fare hikes. They need to roll up their sleeves and think of ways to make money on their own. You gotta spend money to make money. Metro is perfectly capable of doing that for the freeways with toll lanes and Metro ExpressLanes, why can’t you guys do it for the MTA? Geez, people. Read the article carefully. Metro is spending our tax dollars so that they can actually CHARGE car drivers tolls to use the freeway. They’re spending $352 million + $175 million from federal grants to add a TOLLED HOV lane. TOLLED is the keyword here. It’s not just a freeway expansion project, it’s a TOLLED freeway expansion project. The proposal isn’t completely clear to me. Will the toll be only on added HOV lane/lanes or will it be all the lanes on that stretch of the freeway? I hope that is not the case. If so, it will cause more traffic on side roads. I already “pay a toll” with the high cost of the gas tax we already pay that is supposed to be set aside for road maintenance and improvement. And also take note, Santa Clarita, the High Desert Corridor project will also be tolled and will send a substantial amount of truck traffic in your direction.